It’s all part of our quest to fully understand what’s happening around Eastbourne; to immerse ourselves in the activities and opportunities on offer to provide the ultimate feedback and guidance for our guests. It has absolutely nothing to do with our enjoyment. Honest. Hale and Pace, the former comedy duo, are now playing it straight, starring in the West End hit Murder by Misadventure at the Devonshire Park Theatre in Eastbourne until mid-August. Hardly the most arduous couple of hours for us to endure as reviewers – nicely played, great set and enjoyable thriller – well worth a night out if you’re in town. Should you be here with family we can now heartily recommend a couple of options. Apparently 64% of urban children when asked where milk comes from replied Tesco (you can imagine the Daily Mail headlines). So, if you fancy the opportunity to get some mud on the wheels of your 4X4 (at least from their car park) and a chance to expose the children to some four-legged furry animals then Blackberry Farm, just off the A22, should be on your hit-list. Collect some eggs, feed the goats, sheep and pigs, ride a pony, charge around the adventure playground and reward yourself with coffee and cake in their dinky cafe. And who wouldn’t want to play train drivers for a morning at the Eastbourne Miniature Steam Railway? 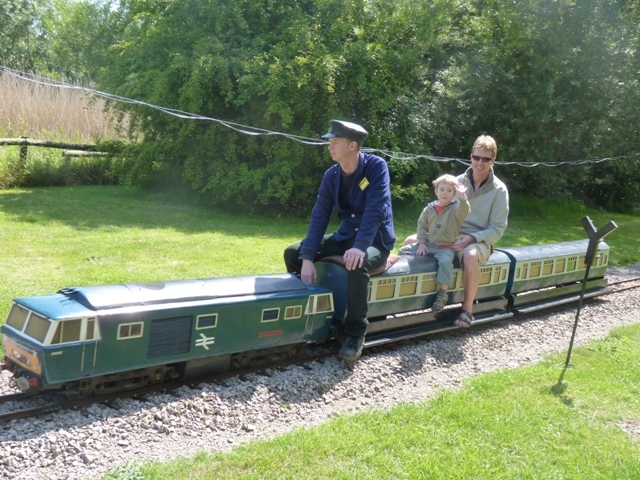 Straddle a miniature locomotive as it meanders its way around a country park, stroll around their lake and indulge in a cream tea (you might detect a theme here…). So, a thoroughly exhausting exercise in the name of market research, but you can now confidently plan your next visit in Eastbourne. Actually, I need to add that the mackerel have finally arrived in numbers so I suggest you also add a visit to the fishing shop at the end of the pier. Hire a rod and appropriate kit, target high tide and prepare to snare your supper. You won’t even need to dress them (as recent guests here from Germany/Japan discovered) – yours truly can take care of the gooey bits whie you can just sit back and enjoy. Really, the things I do for my guests!